Your development teams collaborate every day. And tools like Slack make that collaboration easier. With the Helix ALM Slack integration, you can improve development workflows and team collaboration. When you share a link to a Helix ALM item in an integrated Slack channel, you’ll see a quick overview of that item. You can share an item with another team member — and they’ll immediately know what you’re talking about. This works for all Helix ALM items — requirements, requirement documents, test cases, test runs, and issues. That means everyone can collaborate on items across your development workflow. Important conversations happen in Slack. And you can now track those conversations within Helix ALM. For example, you might be looking at a requirement in Helix ALM. You’ll be able to see comments from Slack about that requirement. So, you’ll always know what conversations have taken place about your Helix ALM items. And you’ll know what decisions were made. Staying up-to-date on development workflows isn’t always easy. But with this integration, you can easily push Helix ALM updates to Slack. Helix ALM triggers utilize Slack webhooks to keep everyone in the loop as your project progresses. It only takes five steps to get up and running with the Helix ALM Slack integration. Click Add to Slack to add the Helix ALM app to your workspace. After you authorize adding the application, you are guided through a wizard to configure a Helix ALM Slack Bot. The bot handles communication between Slack and Helix ALM. After you complete a few fields in the wizard, a bot package is created for you. Extract the package on the computer where you want to host it. Start the bot executable. You can also configure the bot to run as a service. What Information Does the Helix ALM Slack Bot Show About an Item? When you paste a Helix ALM item URL (ttstudio://, https://, or http://) in a Slack channel, it automatically shows you basic information about the item. This includes item summary, type, status, and description. If the item has any comments, you see them in the conversation thread. How Do I Push Information From Helix ALM to Slack? A developer can write a trigger to push Helix ALM item information to a Slack workspace. 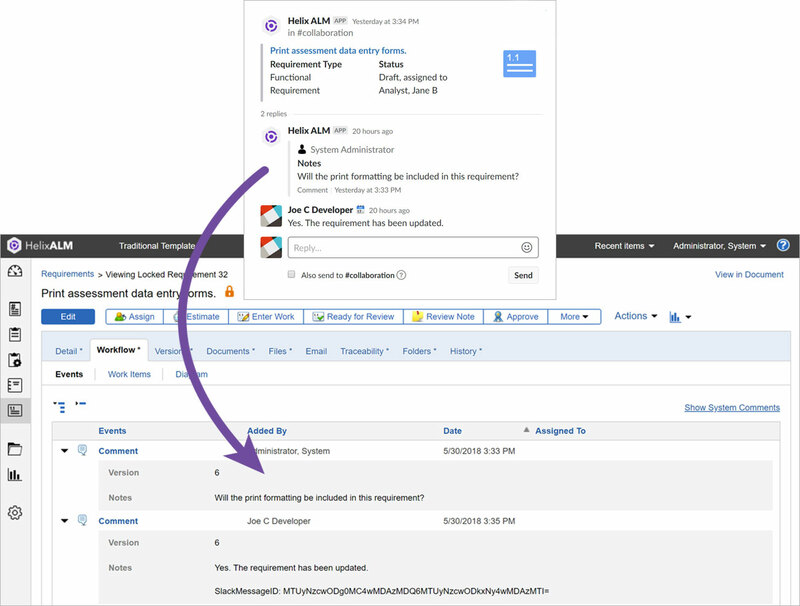 For example, you can post information about new issues added to a Helix ALM project or updates to issues. Check out code examples to get started. What Helix ALM Item Types Are Supported in Slack? All Helix ALM items — issues, requirements, requirement documents, test cases, and test runs. Are Slack Conversations About a Helix ALM Item Tracked With That Item? Yes. Any replies to Helix ALM messages are added to the item workflow as comments. Team members who look at the item in Helix ALM can see the conversation. How Do I View Slack Conversations About Items in Helix ALM? Go to the item and click the Workflow tab. For each reply, you can see a comment that contains the text from the reply and information about the user who replied, and the Slack workspace and channel. Get started with the Helix ALM Slack integration today. Not using Helix ALM yet? Start your free trial.